Last year may not have delivered the bounce-back that media owners were hoping for, but the latest adspend figures reflect the beginnings of a solid recovery. You might call it a dead-cat bounce, or a tantalising upstroke in the middle of a W-shape recession, or even the beginning of an honest-to-god recovery, but you couldn't call 2010 a bad year for advertising. Unless your business depended entirely on radio display advertising, that is. Procter & Gamble was anointed Britain's biggest advertiser in traditional media, and not only as a consequence of the much-heralded 50% cut in COI investment. The FMCG company increased its spend by more than 30%, even as its use of social media (which is not reflected in these figures) rocketed. BSkyB, too, powered into the upper echelon of big spenders, but in reality, very few big-hitting advertisers lost their nerve when it came to investing in traditional media. Notably, many advertisers were increasing their spend from a very low base in 2009, where budgets were slashed across the board. There also remains a nagging concern among media owners that the VAT rise, combined with the government's austerity drive will equate to a nosedive in adspend. The fact that such a situation doesn't entirely seem to be materialising would suggest that, if the ad market is a dead cat, it's a particularly bouncy one. Many of the newspapers - The Sun, the Daily Mail - are pretty much retail catalogues, and the supermarkets are absolutely their lifeblood. At the beginning of 2010, when cars and banks had dropped out, the retailers became an even higher proportion than usual. There was a double benefit, though, because in addition to Tesco and Asda and the usual big advertisers, companies such as Lidl, Aldi and Morrisons came in with lots of money, creating a retail boost in the recession. Against that, this year, when things are a bit better, those extra advertisers have gone away, while car manufacturers are not spending a huge amount, as they did in the more buoyant part of last year. At the moment, the press market is very weak, but I happen to think that is just for the moment. Newspapers are proving surprisingly resilient, given that circulation and readership are down and the economy still isn't exactly booming. Certainly, there is no sense of panic among media owners. The state of the radio market last year really depends on who you talk to. Most of the radio groups will tell you that 2010 was actually a pretty good year, even if the figures suggest display revenues were down, because all the other elements - sponsorship, events, the digital piece - increasingly need to be taken into account when you are looking at radio revenue streams. This is why most radio businesses are calling 2010 the great disaster that never happened. Apart from the continued uptake of sponsorship and those other diversified offerings, a lot of brands came into radio last year. We had Asda spending for pretty much the first time and Kellogg increasing its spend, and the brand count was positive. Being reliant on such a big advertiser as the COI always put radio in a slightly difficult position, and I think the reduction in spend might just have been a good thing. Last year, telecoms companies spent a lot more money year on year. The bigger ones are very sizeable advertisers now - if they raise their spend in a given sector, as they did in TV, it makes a real difference. Along with those, car advertising came back to TV again, as did financial. They have all helped to fill that void left by the COI. Of course, the COI was a massive advertiser, and the cuts it has made did have an effect, but it was very much expected. Also, as some advertisers have gone down, others have come up, such as Autoglass in radio, where it has become one of the biggest spenders. What we have found with TV is that clients are saying: 'My budget has gone down from £20m to £15m overall, but I still want to keep the same £10m in television.' In times of hardship, marketers tend to go with the media they know and trust. The General Election and the World Cup were big, inclusive events that affected people as they moved around cities, and which helped outdoor come back from a pretty bad 2009. At the same time, the rate of growth in digital was three times that of the medium as a whole, showing a 37% uplift. Media-owner investment has been sensational in terms of the quality of the digital product, and that has meant that advertisers are embracing the fact that you can do more interesting things. We saw some of our mainstream clients, such as Ford, Unilever and IBM, being very creative in their use of digital out-of-home. We also found that advertisers were planning further ahead to get the best prices. That was a macro-economic factor, and a reflection of the fact that advertisers in sectors such as finance needed to regain the trust of the consumer. 2009 was about a value message, but in 2010, brands had a lot more to say, and outdoor allowed them to do that with clear, bold messages. The great strength of cinema is branding; it is not necessarily used for tactical or call to action. Given the situation we were in last year, where a lot of advertisers were shifting their strategy to be more tactical or POS-led, that could translate to those brands stepping away from cinema. That's particularly true when you consider that TV costs were up last year. No one was really predicting the extent of the increase, and the very fact that TV revenue was up by so much could have had an effect on cinema. Advertisers set their media plans at the beginning of the year, and once TV goes up, they often want to stick to the amount of ratings they had originally set, despite the increased costs. Naturally, other media will tend to suffer, and that might easily mean that cinema is rejected. Some brands may think that the rising cost of TV is prohibitive and therefore put their money elsewhere, but the trend tends to be the opposite. - Beauty Nice'n easy Perfect 10 and Nice'n easy Foam. - Household Actilift technology introduced across the Ariel range; Ariel Stain Remover, a new category for P&G. - AirCare Odour elimination technology, introduced to the market-leading Febreze range. - Babycare Pampers DryMax technology. 'It's our biggest innovation for 25 years on Pampers - our biggest brand, worth $9bn globally - and it's been a massive hit,' says Donnelly. 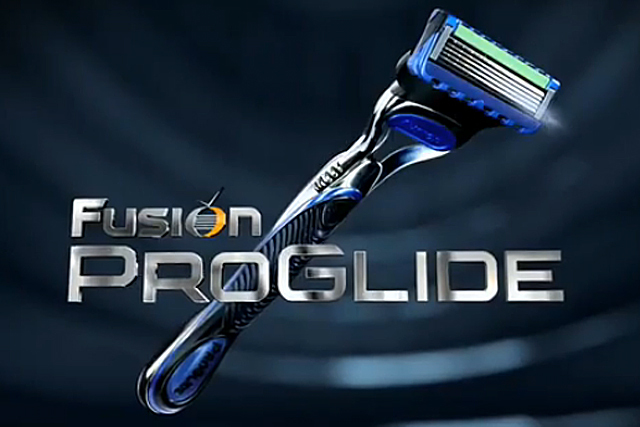 - Shaving Gillette Fusion ProGlide. 'This was a huge campaign - unprecedented really - and there's a lot more to come ... but we can't talk about that yet,' adds Donnelly. All our marketing is driven by our strategy to reach more consumers with our brands and to build greater connections with each and every one of them. Our investment reflects the specific needs of each brand and the business, but it also reflects our changing consumers. We are seeing people spend more time online, on social networks and gaming, and we're exploring more marketing opportunities here. But traditional media are still crucial. Successful campaigns today are centred on big ideas driven by a killer consumer insight, and need to play right across the mix. The more innovative you can be in your execution, the more consumers you'll reach. Launching products and campaigns is crucial. We have one of the most formidable innovation pipelines I've seen in my time at P&G, and we've had some fantastic launches in the past year right across our portfolio. Even through challenging economic times, consumers still look for new products. Innovation still excites them, and our marketing and in-store communications have been crucial in driving that forward. But you also have a base to maintain, of trusted favourites that people love. It's an important balance to strike. All figures are estimated costs based on factors including rate card, industry discounts and viewing figures; they refer to display advertising only. The year-on-year change in outdoor adspend appears high due to a change in the way the industry reports information. The Outdoor Media Centre now funnels data through Key Systems, which collates and harmonises the information. Direct mail and internet data is one month behind, due to collation of full-month panel data. Full details of the methodology used are available from Nielsen. Data cannot be reprinted without prior permission from Nielsen.